So I had these two portobella mushroom caps sitting in my fridge, slowly ambling toward the world of rotten produce. Though it’s only the first week of classes, vet school is proving to be unwelcoming to risottos and the like–food items that require over half an hour to prepare. 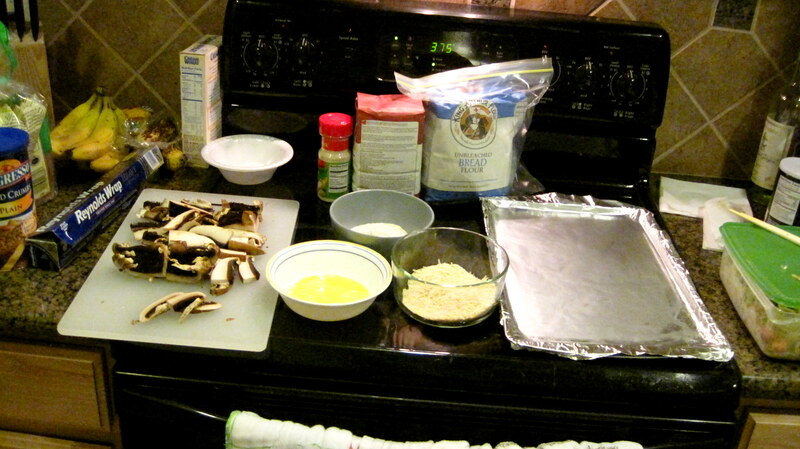 I looked around for a nice, quick recipe to use up my mushrooms, and happened upon a blog post for portobello fries. Simple enough–just bread sliced mushrooms and bake. A few internet malfunctions and browser crashes later (GRR LENOVO WHAT IS THIS?! ), I’d lost the blog and decided just to wing it. My advice to you: find that recipe. Or figure out how much salt you generally like in your breading batter and add 4/3 times as much garlic salt. Or less. I don’t know. I didn’t know that garlic salt was more salt than garlic. I thought it was the other way around. I got very, very, very salty portobello fries. Good gosh I’m still gulping down water. Here’s a rough rundown of what I did. Few measurements because I, being a combination of very hungry, very tired, and very frustrated with my computer, just dumped stuff in a bowl. Preheat oven to 375 degrees. 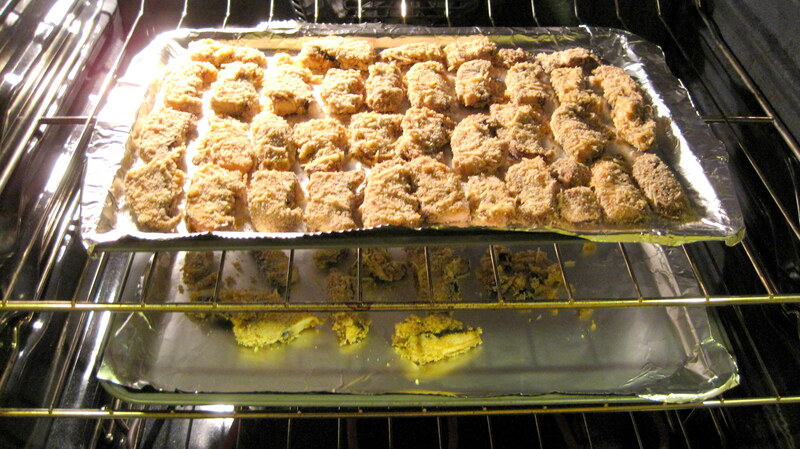 Set up your breading station with a bowl of flour, a bowl of egg, and a bowl of breading mix. 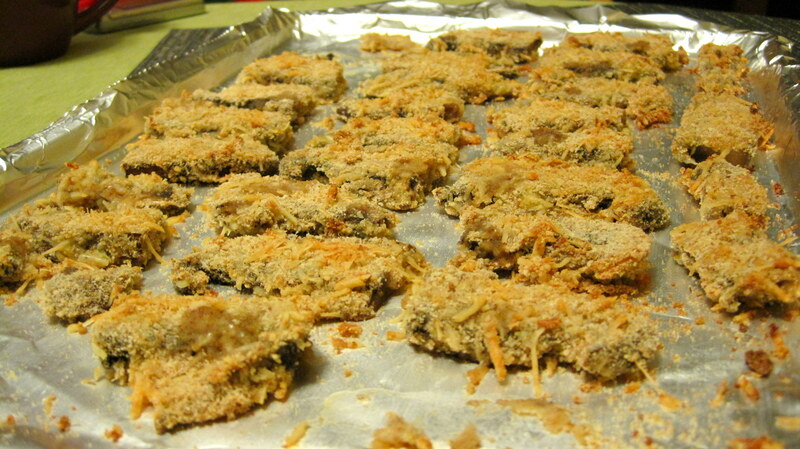 Cover the mushroom slices with flour, egg, and breading, in that order, then place on a greased lined cookie sheet. Bake for about 15 minutes or until golden brown. Consume with copious amounts of water and the great feeling that you’re eating baked fries, not fried fries. Woo, health! I biked to work and back today so I was really really hungry when I passed the Foodmaster. So I decided to buy pizza ingredients, and went home and made a great almost everything pizza. Mostly I was able to use fresh produce from my garden as well as some leftover veggies from haymarket. Yes it’s strange but both fresh and old veggies taste good together. Spread pasta sauce over the crust, then tear basil into small pieces and scatter throughout sauce. Cover that with a layer of shredded cheese blend. Cut the sharp cheddar into larger, thin slices and distribute thickly over the shredded cheese. Cut pepper half into thin slices. Dice the onions finely. Cut ham into small pieces. Spread all three toppings over the cheese. Cut the cherry tomatoes into quarters, and top the pizza. Bake in the oven for 10 minutes. Cut into quarters and eat greedily.